Pro powerlifter Mark Bell answers your questions about picking very, very heavy objects up off the floor without injuring your back. Hey, Mark, I caught a video of you doing a 755-pound deadlift, easy, in your last meet. I got all hyped up to deadlift the next day, and I hurt my back using 275. How do you guys dead such heavy loads without wrecking your back? Mark: The short answer: We can abuse our backs because our backs are strong. The most "dangerous" exercises are some of the best for building strength. Always weigh the risk-to-benefit ratio, but leave the safe exercises for the soccer moms. In your case, I'd seek the opinion of a doctor just to make sure nothing horrible happened. Having said that, I hear this kind of thing all the time. To be honest, it makes me wanna puke. Your back doesn't hurt because of deadlifting. 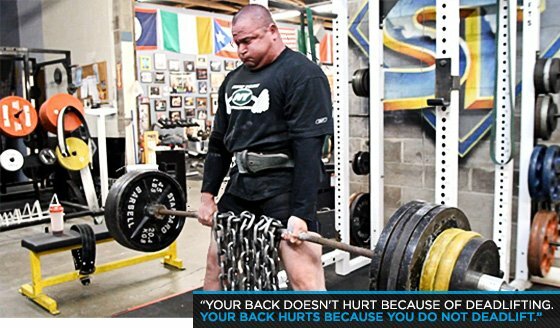 Your back hurts because you do not deadlift. So when you finally do try it, you're a weakling. Weakness in any form is unacceptable in powerlifting. It should be unacceptable to all of you sitting at your computers surfing Bodybuilding.com. If you're not in the gym to get jacked or to get brutally strong, what the hell are you lifting for, Joey Tank Top? When us powerlifters are in the gym, we're on a mission to get strong as hell. Let's build some muscle—that'll help rid you of that fat belly and saggy moobs by making your body burn more calories day and night. And a great way to build muscle and become strong is through awesome exercises like deadlifts. Because you're coming off a slight lower-back injury, start on the road to recovery by working on perfecting your form. Do the "old school" 5 sets of 5 reps, making sure to do every rep of every set using the best form you can maintain. That means you'll have to arch and pull your chest up before starting to pull the weight off the floor. Fill up your belly with air by taking a huge deep breath. Push your belly out hard; make it look like you just killed a giant pizza. Hold your breath until reaching the tip of the lift. This pressure will make you feel as if you're lifting off a rock. The extra stability will allow you to pull the weight off the floor faster. Nine-hundred-pound deadlifters warm up with 135 on the bar, so take your time and warm up light. No reason to tire yourself out before the main event. Missing overly ambitious lifts can lead to injury and actually make you weaker. Pull-ups are one of the best back exercises, but they can be tough for bigger dudes to implement. Any sort of row is a good back exercise. Shrugs, upright rows, and face-pulls are all great options for building upper back and traps. Having strong lats and pulling muscles will drive your deadlift through the roof. Having a stronger base will help prevent injury. Let's say train your gut or belly. At my outfit, Super Training, we do a lot of weighted sit-ups along with side bends, static sit-ups, and planks. I don't want to get into a huge thing about "ab" training, but it needs to be done, and it needs to be done with weight. All of this will involve trial and error. Nothing comes easy, but mastering the basics will take you a long way toward your goals. Don't neglect the details, and you'll be rewarded with a cast iron lower back. Remember, "Every man dies, but not every man really deadlifts."